Would you be interested in movies of the Saints you mentioned above? PM me if you are. "Silver and Gold, I have none, but I give what I have" ~ ( I think St. Peter said this when he cure the lame man ) - I stand to be corrected? So Mariaangelogrow, PM me if you would like them. King Henry V of France died unexpectedly in 1422, leaving his infant son as heir to the throne of England and those areas of France under English control. The death of King Henry was a blow to the English, yet they still had very capable generals who continued to win victories against the French armies. 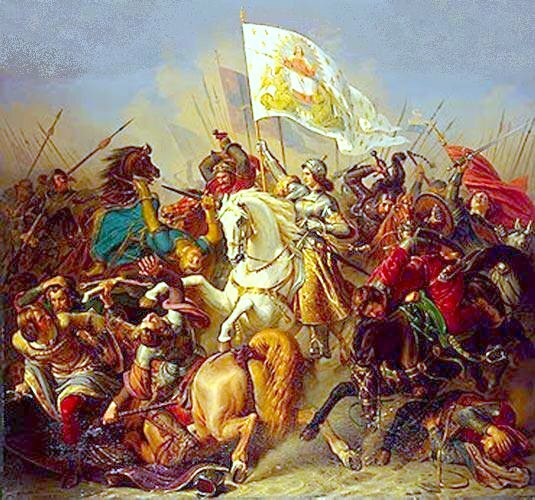 After a devastating loss at Verneuil in 1424, France was so weak that they were unable to even field another army. When it seemed that only a miracle could save France, thirteen-year-old St Joan of Arc suddenly came upon the scene to change the world. It was during the summer of 1425 when St Michael began appearing to Joan, eventually informing her that God had an important mission for her to accomplish. He told her that Saint Margaret and Saint Catherine would soon appear to her. The apparitions of these saints were so real that St Joan of Arc could touch them, and she often listened to their instructions while hugging them about their legs. After instructing Joan the Maid for three years, they revealed to her the mission for which God had chosen her. She was responsible to see that the Dauphin was crowned King of France! Like Judith, who beheaded Halofernes of the Assyrians, God had chosen a weak and humble woman to shame the strong and save her nation. St Joan of Arc was told to go to the knight Robert de Baudricourt, and ask him to officially send her to the Dauphin. Baudricourt listened to her request, but sent St Joan away, adding that her father should box her ears. The next year, 1429, at the insistence of her guides, St Joan of Arc went back to Vaucouleurs, and again Baudricourt turned her down flat. One of his knights, however, Jean de Metz, listened to her when she explained why she had come back. Jean de Metz believed her, and soon Baudricourt was also convinced when St Joan of Arc told him about the French defeat at the battle of Rouvray several days before a courier brought the news. By late April Joan was riding with a small French army of 4,000 to attempt the relief of Orleans. She rode in full armor upon a white horse holding aloft her battle standard. That standard depicted Our Lord holding the world in his hand, with an angel kneeling on either side, and the names of Jesus and Mary proudly displayed. The city of Orleans had been under siege for over half a year, and if it fell it would open up the conquest of the remainder of France. Joan and her army were able to enter the city to reinforce it. On May 4th Joan was suddenly awakened from her sleep by her voices, urging her to attack the enemy at once. St Joan of Arc leapt upon her horse and rode through town gathering and inspiring her troops, and then led them against the English forces laying siege to Orleans. She first attacked Fort St. Loup, which her army defeated so badly that three-quarters of the English garrison were put to the sword. Next was Fort Augustins, and finally Fort Tourelles. 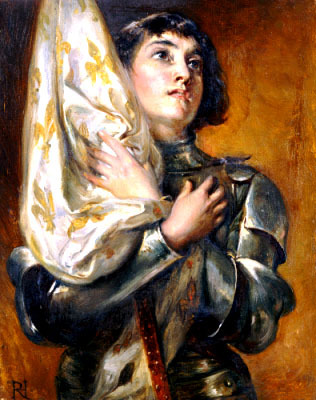 St Joan of Arc and her army attacked Fort Tourelles for 13 hours, and on one of the assaults Joan was wounded by an English arrow which she immediately removed by herself. When it seemed they were bested and about to retreat, Joan led a final charge carrying her gleaming standard that carried the day. The rest of the English army retreated the next day at the same time that Joan rode into Tours in triumph to meet the Dauphin. Sir John Fastolf was approaching with a strong force. Too late to save the English at Orleans, he was ordered to advance to meet the French army where they were attacking the castle of Beaugency. Once again, they arrived too late, and met the remainder of the English forces as they were in full retreat after Joan’s latest victory. Joan, who was actively pursuing the English, came upon the retiring force and Sir John Fastolf’s army in a disorganized condition on the open field, so she seized the opportunity and ordered her army to attack the English. “You have spurs, use them!” she ordered. The French attacked with such vigor that it didn’t matter that they were a mere rabble challenging two of the finest commanders the English possessed. The battle was over in moments, with 2,000 English dead, 200 taken captive, and Lord Scales and Lord Talbot captured. In an amazingly short period of time, the situation in France had completely changed. 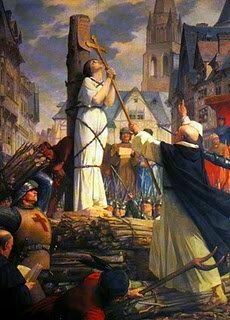 St Joan of Arc had thus completed what God wanted her to accomplish for France, though her greatest battle still lay before her. It was one she would fight alone. The new king did not want Joan to continue engaging the English, and so did not support her as she continued to fight in minor battles. Joan was warned by her voices that she would soon be captured, and it was at Compiegne where she was pulled from her horse and taken captive. She was then sold to the English, who intended to have her tried for imaginary crimes and heresy. St Joan of Arc was burned at the stake on May 30, 1431. St Joan of Arc prayed, and then was fastened to the stake. She asked for a cross when the wood was set ablaze all about her, and died with the name of Jesus on her lips. Indeed, the English were lost. In was not long before they were completely driven from France, excepting the region around Calais. When England later left the Church under King Henry VIII, they did not take the French with them into the darkness of schism. 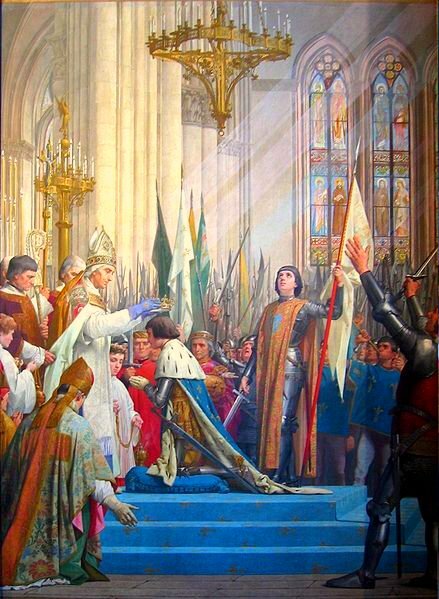 The conclusion of the farcical trial was later justly overturned, and St Joan of Arc was declared a saint by Pope Benedict XV. My favourite Saint is St. Monica, mother of St. Augustine. This is so because, like St. Monica, I have children who are currently not members of the Catholic Church, and I am praying for their salvation. We ought not to be discouraged if our prayers are not immediately granted. For many long years St. Monica prayed for her son's conversion, yet despite her tears and supplications he only fell deeper into sin. One day she went to a bishop and told him her grief. The bishop bade her not be disheartened, since it was impossible that the child of so many tears and prayers should be lost. His words came true; Augustine was converted and became a great saint. For eighteen years his mother ceased not to pray for him. God often does not grant our prayers because what we ask would be hurtful to us. St. Monica, the mother of the great St. Augustine, for many years prayed for her son's conversion without receiving an answer to her petition. Presently Augustine, who was professor of rhetoric in Carthage, informed her of his intention of going to Rome, in order to have a wider sphere of action. His mother, fearing that the great city would offer fresh dangers and temptations for her son, wept bitterly and endeavored to dissuade him from carrying out his project. She spent the whole of the next night in prayer, beseeching God to prevent him from embarking on the voyage; but, the next morning, to her grief, she heard that he had already set sail. Why, it may be asked, did almighty God not grant her prayer? Because Augustine's residence in Italy was to be for his spiritual profit; for in Milan he made the acquaintance of Bishop Ambrose, whose eloquent discourses had the effect of converting him. Later on Augustine himself said: "O Lord, Thou didst not at that time fulfill my mother's desire, in order to grant her that for which she had for so long a time besought Thee." Defend, we beseech Thee, O Lord, through the intercession of the ever glorious Virgin Mary, the Holy Apostles, of St. Augustine and St. Monica, and of all the saints, this our society from all adversity, and graciously preserve it from the snares of the enemies: through our Lord, &amp;c. Amen. At length, God in his mercy complied with the holy widow's desire. Augustine renounced the Manichean heresy and was baptized in his 30th year by St. Ambrose. It may be said with truth that this conversion was the fruit of the prayers and tears of Saint Monica. The consolation that she received from her son's conversion, may be more easily imagined than described. Soon after this event, she determined to return with her son to Africa, but having reached Ostia, where they were obliged to wait for an opportunity to continue their voyage, a slight fever overtook her. At first it was not supposed dangerous, and Augustine himself relates how edifying a conversation he had held with his holy mother on the glories of heaven. She ended it with the following words: "My son, as far as I am concerned, I expect nothing further from this world. I had only one wish, which was to see you a Catholic before I died. God has granted me more than I asked; because I see that you not only serve Him, but that you despise all earthly happiness. What, therefore, remains for me to do upon earth?" Meanwhile, her malady increased so rapidly, that nine days later, St. Monica, who so long had sighed for heaven, gave her soul, adorned with so many virtues, into the hands of her Creator, in her fifty-sixth year. What she requested before her death of her two sons who were present, St. Augustine relates as follows: "Lay my body," said she: "where you like, and allow no thought of it to trouble you. Only one thing I request of you: remember me before the Altar of the Most High wherever you may be." 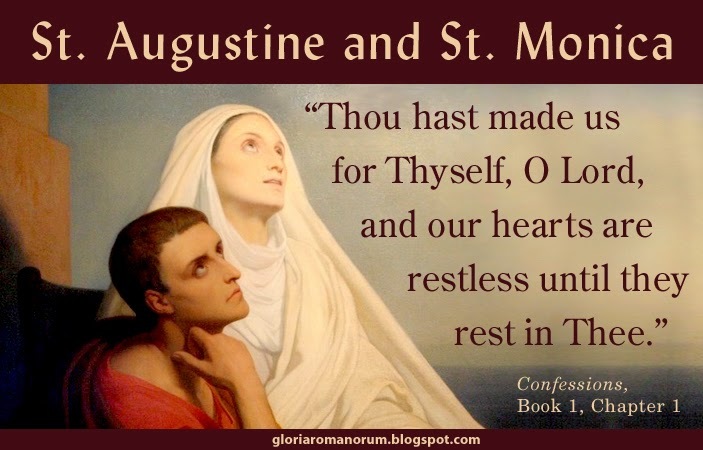 St. Augustine describes also how they placed the body of his holy mother by her open grave, and there offered the sacrifice of our Redemption, the Holy Mass, for the dead before they interred her. A clear evidence that, at that remote period, they also believed in purgatory, and prayed for the dead as we Catholics still do in our days. Cecilia, a Roman maiden born of noble family, brought up from infancy in the teachings of the Christian faith, had vowed her virginity to God. Married against her will to Valerian, on her nuptial night she said to him, "Valerian, I am under the care of an angel who is guardian of my virginity. Do not do, therefore, anything that may arouse the anger of God against you." Valerian was disturbed by these words and did not dare touch her. He even declared that he would believe in Christ if he could see the angel. When Cecilia explained that this was impossible without baptism, he desired so ardently to see the angel that he offered to be baptized. Acting on Cecilia's advice he went to Pope Urban, who because of the persecution was at that time in hiding in the Catacomb of the Martyrs out on the Appian Way. There Urban baptized him. When Vaerian returned to Cecilia he found her at prayer and beside her an angel shining in divine splendor. He was overcome at the sight. As soon as recovered from his awe-inspired fright, Valerian summonded his brother, Tiburtius. He, too, was instructed by Cecilia in the faith of Christ, and after baptism by Pope Urban, saw the same angel his brother had seen. Shortly afterward both brothers bravely suffered martyrdom at the hands of the prefect Almachius, who aslo ordered the arrest of Cecilia. Almachius questioned her first about the disposal of the property of Tiburtius and Valerian. When Cecilia replied that all their wealth had been distributed to the poor, Almachius flew into a rage. He ordered her to be taken home to her own house to be put to death by the heat of the bath. For a day and a night she remained unharmed by its fiery breath. Then an executioner was ent for. Although he struck three blows with an axe, he was unable to sever her head, so he left her half dead. She lingered three days. Then on September 16, in the riegn of the emperor Alexander, crowned with the dual palm of virginity and martyrdom, she took her flight to heaven. The same pontiff Urban burried her body in the cemetery of Callistus. A church was set up in her house and dedicated under the name of cecilia. Her body and those of Popes Urban and Lucius, and of Tiburtius, Valerian and Maximus were brought back into the City by Pope Paschall I., and were buried together in the church of St. Cecilia. Among the most remarkable works is the graphic altar sculpture of St. Cecilia (1600) by the late-Renaissance sculptor Stefano Maderno. The pavement in front of the statue encloses a marble slab with Maderno's sworn statement that he has recorded the body as he saw it when the tomb was opened in 1599. The statue depicts the three axe strokes described in the 5th-century account of her martyrdom. It also is meant to underscore the incorruptibility of her cadaver (an attribute of some saints), which miraculously still had congealed blood after centuries. This statue could be conceived as proto-Baroque, since it depicts no idealized moment or person, but a theatric scene, a naturalistic representation of a dead or dying saint. It is striking, because it precedes by decades the similar high-Baroque sculptures of Gian Lorenzo Bernini (for example, his Beata Ludovica Albertoni) and Melchiorre Caffà (Santa Rosa de Lima).